OUR TOWN, YOU CAN’T TAKE IT WITH YOU, and ARSENIC AND OLD LACE – Plays for All Time? Recently. in an American Theatre Magazine article that cited a NPR analysis survey it was revealed that George S. Kaufman and Moss Hart’s You Can’t Take It With You (1936), Thornton Wilder’s Our Town (1938) and Joseph Kesselring’s Arsenic and Old Lace (1939) were the three most often performed plays in American High Schools from the 1940s to today. What do all these plays have in common? Why would these plays have such strong appeal? Well, for a start, as cited above , they were all written and first performed in the 1930s and subsequently arise from and are responses to this decade and what is known as ‘The Great Depression’. Two of them, You Can’t Take It With You and Our Town won the Pulitzer Prize for Drama for their respective years. Two of them, You Can’t Take It With You and Arsenic and Old Lace became highly successful films, both directed by Frank Capra, with You Can’t Take It With You winning the Academy Award for Best Picture for 1938, and Best Director for Frank Capra, his third in five years. 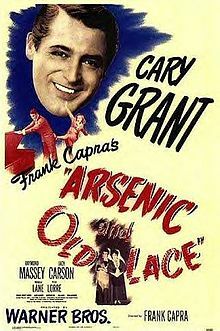 Arsenic and Old Lace was actually filmed in 1941 but not released until 1944 after it had closed on Broadway. The film featured Cary Grant, and from the original Broadway cast Josephine Hull and Jean Adair as the murderous elderly spinster aunts, and John Alexander as Uncle Teddy Roosevelt. 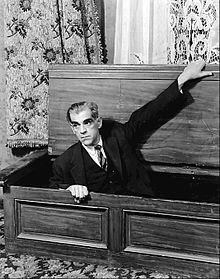 Boris Karloff who originally played the criminal psychopathic Jonathan Brewster, which in itself was a spoof on Karloff’s screen persona, was not available to do the film due to his Broadway commitments. His role was performed by Raymond Massey, supported by Peter Lorre. Two of these plays, You Can’t Take It With You and Arsenic and Old Lace are comedies, although wildly different. You Cant’ Take It With You is a ‘romantic comedy’, whilst Arsenic and Old Lace is a farcical ‘black comedy’. Our Town almost defies categorization in that it is a brilliant piece of ‘meta-theatre’, the three acts being different in tone, with the extraordinary Third Act being almost tragic in its funereal dream-like portrayal of the circle of life. That Our Town and You Can’t Take It With You have been and are popular in American High Schools is partly understandable due to their relative large casts; Arsenic and Old Lace also has what is in moderns terms a large cast, the number of character being 14, but the other two plays have significantly more characters. These then are the bare facts surrounding these three plays, each unique in their own way, yet as outlined above share certain things in common. That all three are products of the 1930s must be of significance, and that those turbulent years in which ordinary Americans faced such incredible hardships and the ever present fear of poverty and destitution, financially as well as morally and ethically, may be the reason why they have repeatedly resonated with the American humanist education system, teachers, students, staff and parents, for over eight decades. Wonderful and extraordinary. Whilst it is more than likely that there probably will be an outcry against the dominance of these three ‘dead white male’ playwrights, nonetheless, that these three wonderful plays continue to have such a strong appeal and are instrumental in revealing to young people the joy and wonder of the theatre is something I believe should be celebrated rather than criticized. Personally, I feel very lucky to have seen professional as well as amateur productions of these plays. What has always amazed me is the way audiences immediately respond to the vibrancy of the respective characters in each play. I can’t remember how old I was, but very young, when I first saw Our Town. It was at the Independent Theatre in North Sydney and I still retain vivid images in my memory of this production, particularly the hilarity of the wedding in Act Two and the sense of loss and grief that is Act Three, which done with such simplicity and grace – dead people sitting on chairs in a graveyard as if waiting for something (Godot? The Day of Judgement? ), which is part of its shocking devastation. Nearly forty years later I was fortunate to see in New York at the tiny Barrow Street Theatre David Cromer’s wonderful and intimate production. This production was truly thrilling, withe large cast performing in the aisles and in modern clothes, with virtually everything being mimed re props etc.The only time the production went into naturalistic 1930s ‘period’ was in the Act 3 sequence involving Emily revisiting her childhood, which in the context of the production, and that it is the only time such a thing happens in the play, made absolute sense and was disarming – and provocative in the sense that as a type of ‘dream sequence’ it was more colorful and vibrant than the ‘modern’ imagined perspective of this production. Not that this is a criticism. On the contrary, this perspective was completely in harmony with Wilder’s original creative impulse, to strip back the artifice of the then contemporary theatre of the 1930s. What any production of Our Town is dependent on is a united ensemble who are all committed to the play and exist in the same imaginary world. Whereas other productions of this beautiful play have been a little inconsistent in this regard, David Cromer’s production most certainly achieved this unified vision and was most definitely the best production of Our Town that I have seen. The intimacy of the performing space and the way the play was staged went a long way in making this a wonderful experience. Despite the meta-theatre aspect of the play, which is definitely a part of its charm, Wilder’s aim was to provide something more realistic than naturalistic, to honor in his own unique way the strength of ordinary American citizens who had dealt with the nightmare of the Great Depression in the 1930s. Furthermore, despite the ensemble nature of the play, any production is reliant on having very good actors, particularly those playing the Stage Manager and Emily. This reveals a small but significant issue in that Our Town can also be a particular type of vehicle for ‘star’ performers, as evident in the number of notable actors, including Paul Newman, who have played the Stage Manager. Subsequently, despite Wilder’s vision, the play is very much in line with other plays, particularly from the 1930s, that were vehicles for contemporary ‘star’ performers, such a Lillian Helman’s The Little Foxes (1939), the success of which was largely due to the ‘star’ performance of Tallulah Bankhead as Regina Giddens. to ‘modern’ sensibilities and tastes, which would probably regard these things as very old-fashioned (which they are), I absolutely adore this genre of plays and films – and it all began with this Old Tote production of Arsenic and Old Lace. Laughter and thrills and scares, great characters and plot-lines and great wit – hilarious fun. I clearly remember the moment when Max Phipps as Jonathan Brewster suddenly burst through a window and everyone in the audience screamed – and then laughed. Why do we laugh at such dark deeds? Well – as Maurice Sendak noted in regard to the international popularity of his marvelous Where the Wild Things Are, (1963), there is a side to us all that enjoys horror, with the sudden shock and the subsequent giggle similar to how babies laugh when you play peek-a-boo games with them. That child-like response remains with us adulthood and hence the popularity of the comedy-horror dramatic genre. Maybe this is one reason why Arsenic and Old Lace is so popular with American High schools – that it touches on something wonderful and mystical human – that we like to be scared. In actual fact, this genre begins in the ancient classical period. 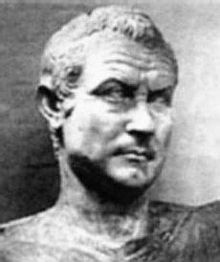 The Roman comic playwright, Plautus (c. 254-184 BCE) wrote his Mostellaria (The Haunted House) during the period of the Roman Republic. Stephen Sondheim makes reference to this play in his A Funny Thing Happened of the Way to the Forum (1962). If you want to learn a bit more about this type of drama then by all means watch Frank Cap ra’s Arsenic and Old Lace, with Gary Grant. His performance is truly terrific and a lesson in comic acting, particularly in regard to the ‘double-take’ . 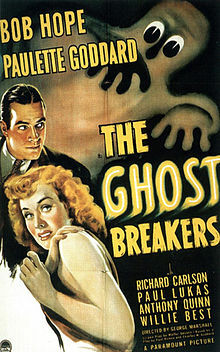 Others I would thoroughly recommend are The Cat and the Canary (1939), with Bob Hope and Paulette Goddard, and their follow-up The Ghost Breakers (1940), and whilst not really a comedy-horror but certainly in the ‘old dark house’ genre is Lewis Alan’s genuinely creepy The Uninvited (1944). As you may have already noticed, in regard to American drama, the popularity of this genre, which also includes Abbott and Costello’s Hold That Ghost (1941), comes during the World War 2 period (1939-1945), even though the US did not officially enter that war until 1941. What does this mean in regard to the current popularity of Arsenic and Old Lace? I may be reading to much into this, but one of the pivitol aspects of this genre is that there is a kind of besieged mentality and pressure on the respective characters, plus the fact that good triumphs over evil – well, sort of. In the case of Arsenic and Old Lace the ending is somewhat beguilingly – funny but also chilling as despite promises to the contrary the spinster aunts can’t help themselves and begin to serve their poisonous elderberry wine to their next victim. This besieged mentality, however, may be another factor in the modern popularity of Arsenic and Old Lace, which combined with the thrill of being scared and then laughing at that fear, has a kind of cathartic release for modern American teenagers. Little wonder that they may need it, to laugh at the face of death, considering the fear generated from the numerous school shootings that are tragically and horrifically so much part of modern life in America. As with Our Town the characters in Arsenic and Old Lace are vivid and colourful, and very theatrical. There is a kind of braggadocio and engaging self-confidence in their actions and comic dimensions. For ex ample, the two spinster aunts are described as ‘pressed rose leaves’ (makes me laugh). The characters are truly eccentric, such Uncle Teddy who is quite insane – harmless, but insane, who thinks he is President Teddy Roosevelt with a panchant to yell ‘Charge’ as he runs upstairs; but as is said ‘there’s a lot of worst guys he could be’. The self-conscious mad-cap theatricality is heightened by the hero of the play, Mortimer Brewster is a successful Broadway critic and playwright, who as well as dealing with his insane relatives (“Insanity runs in my family – it practically gallops!’) has to dodge the ambitions of a police officer who wants Mortimer to read his play, and then there is Mortimer’s brother, the true villain of the play, Jonathan Brewster. There is a running-joke throughout the play by other characters saying that Jonathan reminds them of Boris Karloff, the original Frankenstein’s monster and whose screen persona was associated with murderous monsters. The thing is that in the original production, Jonathan Brewster was played by Boris Karloff, which only added to the fun. What is significant about this, as well as Cary Grant playing Mortimer Brewster in Capra’s film, is that like Emily and the Stage Manager in Our Town, these roles demand ‘star’ performers. I will return to this issue again when discussing You Can’t Take It With You. Arsenic and Old Lace also is an example of what is known as American ‘screw-ball comedy’. This is genre that also reached its height in the 1930s and 1940s. I love it. It does, however, demand certain things from the actors, and not all actors are capable of playing this genre of comedy. It is fast paced – very fast paced – in thoughts, words and deeds; that is the truth of these particular imaginary worlds. There is absolutely no place for modern ‘ums’ and pauses before you speak. Being adept at comic timing, entrances and exits, and clear energ etic delivery of lines is essential. As with all things really, you have to think on the line, responding immediately, otherwise the jokes don’t work and the wit falls flat. An example that I use to show students how fast they must go is Howard Hawk’s His Girl Friday (1940), which is based on one the great American comedies – Ben Hecht and Charles MacArthur’s The Front Page (1928). His Girl Friday, which stars Cary Grant and Rosalind Russell, is still the fastest recorded dialogue on film – and yes – it is very fast. Other favourites include – well, basically anything by Frank Capra – his film It Happened One Night (1934) was the first film to win all five top Academy Awards – Best Film, Actor, Actress, Director, Screenplay – something that did not occur again until Milos Forman’s One Flew Over The Cuckoos Nest (1975). It is also one of the first ‘road’ movies. 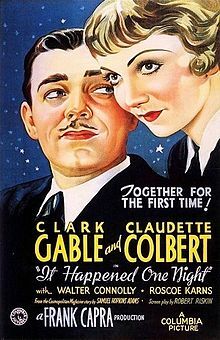 Other brilliant American ‘screwball comedies’ include My Man Godfrey (1936), with William Powell and Carol Lombard, Howard Hawks’ Bringing Up Baby (1938), with Cary Grant and Katherine Hepburn, and Preston Sturges’ The Lady Eve (1941), with Henry Fonda and Barbara Stanwyck, and Sullivan’s Travels (1942), with Joel McCrea and Veronica Lake. One further thing about the extraordinary nature of Arsenic and Old Lace is its normality. By that I mean, despite the absolute insanity and eccentricities of the characters there is a social etiquette, complementing 1930s/40s American social customs and graces, which is ruthlessly observed. Subsequently, this is also a kind of ‘comedy of manners’, in that it is perfectly all right to poison and murder lonely old men as long as it is does in an accepted socially respectable way. As such, Arsenic and Old Lace prefigures the crazy world of Joe Orton, as exemplified by Entertaining Mr Sloane (1964) and Loot (1966), in that it is perfectly fine to rob a bank and stuff the loot in the wrapped up corpse of your mother that you have put in the closet, as long as you do it in a socially respectable way. That is the imaginative truth of these crazy imaginative worlds. For example, in Arsenic and Old Lace when Mortimer and his Aunt Abby discover a dead body in the window seat, Mr Spinoza who was murdered by Jonathan, who Aunt Abby refuses to say last rites over because he is a ‘stranger’, and despite the fact that there are twelve other dead bodies in the cellar she couldn’t pretend she knew him because it would be a ‘fib’. Aunt Martha agrees, that it is ‘a terrible thing to bury a Methodist with a foreigner’. Hilarious – if done in the right way with complete sincerity and truth. One joke that I also mischievoulsy love is the mystery behind what is called ‘The Melbourne Method’. It is a particular operation, or rather a way to murder someone, that Jonathan wants he and his partner, Dr. Einstien, to perform on his brother Mortimer – ‘No, Johnny. Not “The Melbourne Method!” I love Arsenic and Old Lace – it is truly hilariously audaciously deliciously insane. Long may it reign as one of the most popular plays performed in American high schools. You Can’t Take It With You is the second of what is generally regarded as the top three plays written by Moss Hart and George S Kaufman – the others being Once in a Lifetime (1930) and The Man Who Came to Dinner (1939). I have seen professional and amateur productions of all three, and have directed Once in a Lifetime –twice. It is not really surprising that these plays are still popular – the large casts are perfect for high schools as well as drama schools, the characters are all terrific no matter how big and how small – they are all fun to play and if you have a clever and inventive actor even the smallest role has the potential to steal a scene. Similar to Wilder and Kesselring, there is a great care and delicacy in dealing with young and elderly characters. Furthermore, as far as I am concerned, Kaufman and Hart are also terrific at creating some of the best female characters in American drama. For example, Mae, the heroine of Once in A Lifetime, and in the same play, Miss Leighton, the extraordinary receptionist at Glogauer Studios. There is also Maggie Cutler and Lorraine Sheldon in The Man Who Came to Dinner. In You Can’t Take It With You, whilst the main character may be Grandpa Vanderhof, there is an absolute plethora of wonderful female characters, including his grand-daughter Alice Kirby. Grandpa Vanderhof’s household is as mad-cap and as eccentric as the Brewster household in Arsenic and Old Lace, although certainly not as murderous. There is his daughter Penny Sycamore, and her daughter’s Alice and Essie. True to the dictates of classical comedy and the role and function of the lovers, Alice’s romantic relationship with the wealthy Tom Kirby is at the centre of the play. Essie, however, is another thing completely. Despite being the elder daughter and married, she is quite child-like, dreaming of one day being a ballet dancer and prancing her way through the play. Like Miss Leighton in Once in a Lifetime, this is a scene stealer role. I so remember Jane Harders’ Essie in George Ogilvie’s Sydney Theatre Company production of You Can’t Take It With You – hilarious! What all three of these plays have in common, and is probably the reason why they remain so popular are the characters and narratives that, despite the eccentricities, or actually because of them, are touched with human warmth – they have a heart. They are not some objectified creature under scrutiny and a modern censorious disapproving eye, as if they are not worthy of anything. In fact, in You Can’t Take It With You, it is their vulnerability due to their eccentricities that makes audiences champion for them – you care for these characters. When was the last time you went to the theatre and actually felt that you cared or even liked the characters, rather than feel that you should care and that what you were seeing was so worthy and sincere that if you didn’t agree you were unworthy and insincere. Eccentricity and a positive life energy as well as a vulnerability makes these wonderful characters excellent for students, and for those experiencing the the theatre for the first time. They are all too human, full of vice and virtues, and vulnerable, which makes them a delight to be with for a couple of hours. When was the last time you felt such delight, gasping at each twist and turn, and genuinely touched by human feeling and empathy? Whilst David Crommer’s production showed another way of doing Old Town it was not a distortion of the original, which is generally the case with so-called ‘innovative’ new productions of old classics. I’m not too sure that the current not-so-bright-young-things-anymore would be capable of doing any of these plays; if they hold true to their director as auteur, let me assume, the graveyard that lies next door in Arsenic and Old Lace would be moved into the house, and the dead bodies the aunts have in the cellar would be seen coming through the walls; Our Town would have movie-cameras all over the place, because combining film and theatre is a relatively new concept (yeah? as relatively new when? try the early 1900s); and You Cant’ Take It With You will be a child’s playground surrounded by overhanging sky-scrappers. It would be conceptual – and not based in naturalism; the truth would be distorted in order to fit in to the vision of this sincere and worthy artist. Enough – criticism of the don-nut theatre practice of today, all sugar and spice and fat with no centre, is not what this article is about. These play do have a centre as written – and it is a great heart. Long may they beat.